Welcome to the Nant y Bedd garden website. This site will show you different aspects of the garden at different times of the year, along with Sue’s general gardening thoughts and details about some of our eco-friendly activities. Either click on the Recent Posts in the right hand column or select an area of interest from the menu buttons above. Better still click Follow at the bottom right of your screen to get instant notification of new posts. For an idea of the garden throughout the year click here. Nant y Bedd is a 6.5 acre organic garden and woodland located at 1200 feet up in the Black Mountains in the Brecon Beacons National Park in Wales. Sue has been gardening here for 38 years, assisted over the past 20 years by Ian. Slowly but surely the garden has grown and evolved with various projects being added over the years, including the natural swimming pond, pictured above with the shepherd’s hut. One of our greatest thrills was being featured in Saga Magazine in mid 2014. The article ran to six pages of wonderful pictures and text. Last year have featured in Country Homes & Interiors (photographed & written by Carole Drake) and House and Garden (Photographed by Britt Willoughby-Dyer and written by Sarah Price). There was also an article in the Organic Way in September / October and most recently a feature on our woodland (complete with interesting typo in the sub-heading!) in the Small Woods Association magazine. A wonderful new development for 2019 (and beyond) is our selection as only one of eleven Royal Horticultural Society (RHS) Partner Gardens in Wales. To be classed alongside the likes of the National Botanic Gardens of Wales, Aberglasney and Dyffryn Gardens is a great privilege – and more than a bit scary! We started last with a bit of a bang, with this lovely video, filmed and produced by Sophie Windsor Clive, documenting some thoughts on the garden in January. We add regular pictures on Instagram and also use Facebook & Twitter. Keep an eye open for these updates. 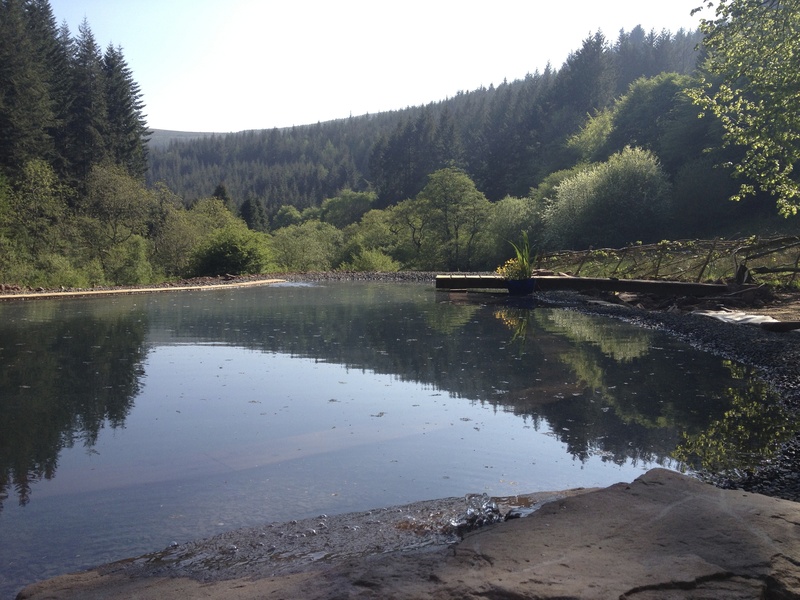 Sometimes called the Garden in the Forest, Nant y Bedd comes as a complete surprise with wonderful mix of organic vegetables, imaginative planting, water, stone and timber features giving something for everyone. You can see here where we are – by zooming out – and the layout of our garden, although much of it is hidden by trees, with the pond clearly showing at the bottom of the field. 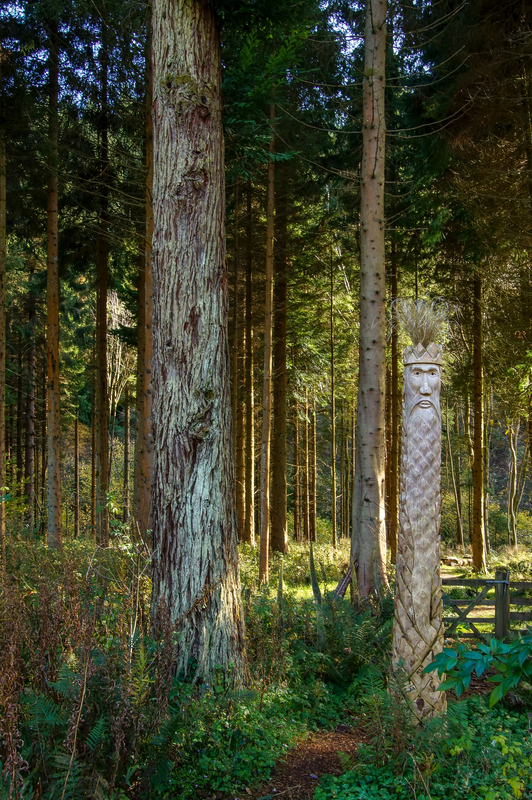 The surprise of Nant y Bedd’s garden stops motorists, cyclists and walkers in their tracks as they emerge from the thick, surrounding, conifer woodland. Nant y Bedd is more than just a garden; it’s part of the living landscape, high in the Black Mountains, bounded by the forest and the beautiful Grwyne Fawr river. Lovingly created over 38 years, there’s something for everyone. A wonderful mixture of organic fruit and vegetables, imaginative planting, mature trees, winding paths, bridges, pond, stream and ‘designer’ dry-stone walls. The garden and its surroundings seamlessly blend into one another, making a sizeable garden feel even bigger. This is a garden which previous visitors have described as “the best garden in Gwent, my 3rd visit!”, “magical garden – part of the landscape”, “really inspiring”, “lovely garden, very different, special ‘atmosphere’” and “can’t wait to return”. This year someone said “you have enhanced Nature” – can’t get much better than that!! Even if you’ve visited before, it’s worth returning, as the garden is constantly evolving, and every year and season brings its own aspects to bear on the look and feel of this amazing place. Sue & Ian are also proud of their efforts in living in the most eco-friendly way possible, planting to help wildlife, using the local timber for cooking and heating (see the attention grabbing wood-stores! ), making their own compost and woodchip paths, and the micro-hydro electricity generating system using the garden’s stream. Make the effort to visit (or revisit) Nant y Bedd; you’ll not regret it! For details of our opening times and charges please see the Visit our Garden page. Despite the short growing period that being at this altitude presents, we’ve opened the garden for 10 years now for the National Gardens Scheme (NGS) and are doing so again on May 26/27th 2019. For more information on the NGS click here. Nant y Bedd (which incidentally translates from the Welsh as Stream of the Grave) featured on BBC2 Open Gardens programme in 2007 just before our first NGS opening, with Carol Klein visiting us on three occasions for the filming. In addition to opening for NGS, we have also opened for the Monmouthshire Eco-Open Doors weekend, where the emphasis is on the green living aspects of Nant y Bedd rather than purely gardening. We add new pictures and comments at regular intervals to let you see how things are changing from season to season and year to year. Just click on Recent Posts to see the latest. Thank you so much for allowing my impromptu visit to your wonderful garden. I fully intend to come again.